Published quarterly or as circumstances allow, Monterey Audubon’s Sanderling Newsletter keeps chapter members abreast of scheduled events, conservation and birding updates, and other useful information. To save cost and reduce our environmental impact, newsletters are availably digitally, except for once a year, usually in fall, when we mail a print copy to all members of record. For suggestions, content submissions or other questions about the newsletter contact our current editor and Carmel native, Michael P. Montgomery. Our Spring 2019 issue, in keeping with springtime’s busy breeding and birding season, features an article about breeding short-eared owls and the citizen scientists who are helping study them, as well as a listing of upcoming conservation events and outings. Winter 2018/2019 highlights HBW’s world birding resource and photography platform “The Internet Bird Collection,” updates from the President as well as calendar updates. The Fall 2018 Sanderling features a profile of John Muir Laws, legendary California illustrator and naturalist, as well as a conservation advocacy update from the President. Local chapter members will also receive this issue as a hard copy in the mail. The Summer 2018 issue features a deep dive into the conservation challenges around one of California's most endangered birds, the tricolored blackbird. Our Spring 2018 issue is Sanderling Editor Michael Montgomery's debut publication for Monterey Audubon. It features a provoking story about the perils of field "playback," as well as an interesting look into the impacts of microclimate on the behavior of California condors. Rich in both detail and superb illustration, the Monterey Breeding Bird Atlas is a must-have for the dedicated birder or regional conservation planner. Monterey Birds (Second Edition), by Don Roberson. Monterey Birds provides richly detailed accounts and analysis of all the nearly 500 species of birds recorded in Monterey County. 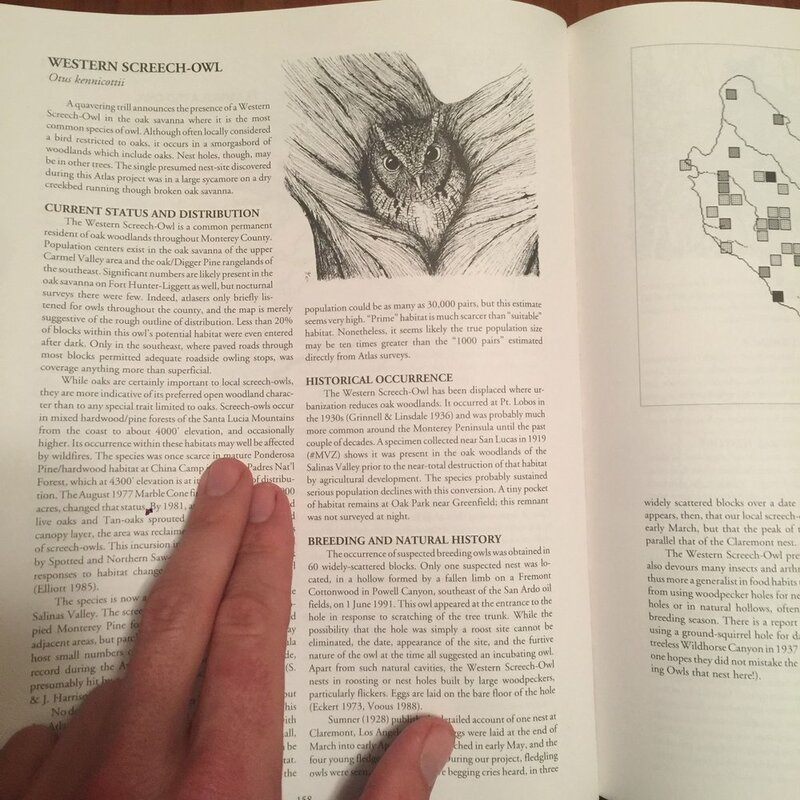 Of particular interest to visiting birders, the book has superb "suggested routes" that will guide you to target species during your stay. Copies are available for a suggested donation of $10 (plus the cost of shipping). You can also purchase them at locations throughout the Monterey Area. Discounts are available for bulk orders, and we are happy to provide books free of charge to all educational or charitable institutions. Send us a note here if you would like a copy. This detailed and definitive analysis of Monterey County's breeding birds has set the standard for breeding bird atlases nationwide. It is a superb conservation planning tool, as well as an invaluable resource for recreational birders. Now in very limited supply, the Atlas has become a sought-after collector's item. If interested in acquiring a copy, please let us know here. This revolutionary data collection platform has empowered birders globally to harness the power of their observations for conservation biology. Create an account for free, today. "Audublog" is Audubon California's blog about conservation and birding. Its timely posts are a great way to keep abreast of current happenings in the state.